I wrote briefly about the Nimble Cargo Scooter after trying one out at the Dwell on Design Show back in June 2014. It was a great concept that placed a heavy cargo in front of the handlebars of a scooter and employed a steering linkage to turn the distant front wheel. But those were tiny wheels, most suited to a polished concrete warehouse environment. The new Nimble is designed for the street, having larger wheels that slightly resemble those found on the popular Razor A5. 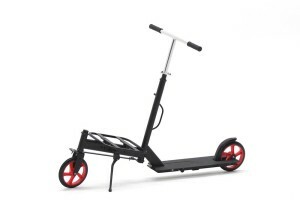 Called the Urban Cargo Scooter, the new Nimble is a response to feedback received for the first type. This new Nimble even folds for compact stowage and carrying, and the cargo rack in front is configurable so it can be a large basket, a bungee rack or a saddlebag rail. I was invited over to the Tustin California HQ to ry one, but alas the invitation arrived after I deserted California and moved to Hawaii. So I have not test ridden it. However video evidence suggests this thing handles very well, and considering the uniqueness of the steering arrangement, this is an impressive feat. Alix Armour, the Co-founder & CEO of Nimble is based in Paris (France) and in Tustin, California and has launched an Indiegogo campaign to help fund further manufacturing and production in California: https://goo.gl/ushNYk. NextNext post: Mad about M.A.D.